I've just finished reading Once You're Lucky, Twice You're Good, about the rise of social media companies in the US. The book, written by Sarah Lacy, will be coming out in the UK officially on 15 September, re-titled for us as The Stories of Facebook, YouTube and MySpace, but why wait? You can buy the original in the UK already. In fact the UK title is misleading, as Lacy focuses most on Max Levchin (PayPal and Slide), Mark Zuckerberg (Facebook), and Kevin Rose (Digg), presumably because the YouTube and MySpace guys were less able to talk openly. No matter. The stories are excellent, the book flows, and you come out of it understanding what is different about these companies when compared to the original dotcoms of the late 1990s. For example you discover how much cheaper it is to start a company (Digg ran for the first few months on just $10,000, including creation of the site, and hosting), why Facebook is gaining traction over MySpace (it is constantly developing and adding new features; MySpace isn't), why many of these companies aren't that bothered about having an IPO (they would lose too much control, and frankly the owners aren't that interested in money), and also how incestuous the whole Web2.0 sector is (so many things link back to PayPal and Netscape). I'm not sure that I agree with all the conclusions, and I still can't get as enthusiastic about Slide.com as Max Levchin, the creator, but this is a very good book to read if you want to understand what is happening in digital media at the moment. 1 - Accidental Empires, by Robert X Cringely. Published in 1996, this explains the rise of personal computing, Microsoft and Apple. 2 - The New New Thing, by Michael Lewis. 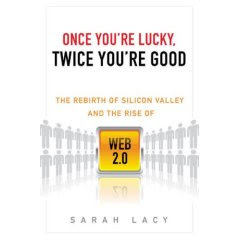 Published in 2000, this explains the rise of the internet and the browser wars, and introduces us to Jim Clark, and Marc Andreessen who also features prominently in Sarah Lacy's book. Oh - and Jim Clark is Chad Hurley of YouTube's father in law. 3 - The Search, by John Battelle. Published in 2006, this is all about Google and the database of intentions.